Zinc (chemical symbol Zn, atomic number 30) is a bluish-white metal that is found in ores in many parts of the world. It is an essential element for living organisms. Various cells in the human body secrete zinc ions, and the proper functioning of many proteins depends on zinc ions. Zinc is thought to be an antioxidant, offering protection against premature aging of the skin and muscles. Zinc salts are used in medications that treat skin rashes, relieve coughs, and fight disease-causing microbes. In addition, zinc is the fourth most common metal in use, trailing only iron, aluminum, and copper in annual production. It is used in alloys such as brass and German silver, and is the main component in the American penny. It is a galvanizing agent that protects steel from corrosion. Zinc oxide is a base for white paints and is also used to protect against sunburn and diaper rash. The chloride of zinc is a deodorant, and the sulfide is used in luminescent paints. The production of zinc metal was very common in ancient India. Many mine sites of Zawarmala (in Rajasthan) were active even as early as 1300-1000 B.C.E. There are references of medicinal uses of zinc in the manuscript known as Charaka Samhita of 300 B.C.E. The Rasa Ratna Samuccaya (800 C.E.) explains the existence of two types of ores for the metal, one of which is ideal for metal extraction, the other, for medicinal purposes . Zinc alloys have been used for centuries. For instance, goods made of brass (an alloy of copper and zinc) dating to 1000–1400 B.C.E. have been found in Israel, and zinc objects with 87 percent zinc have been found in prehistoric Transylvania. Given the low boiling point and high chemical reactivity of this metal, isolated zinc tends to go up the chimney rather than be captured. Consequently, the true nature of zinc was not understood in ancient times. The manufacture of brass was known to the Romans by about 30 B.C.E., using a technique where calamine (a zinc ore) and copper were heated together in a crucible. The zinc oxides in calamine were reduced, and the free zinc metal was trapped by the copper, forming an alloy. The resulting calamine brass was either cast or hammered into shape. Smelting and extraction of impure forms of zinc was being accomplished as early as 1000 C.E. in India and China. In the West, impure zinc as a remnant in melting ovens was known since antiquity, but it was usually thrown away as worthless. Strabo mentions it as pseudo-arguros, or "mock silver." The Berne zinc tablet is a votive plaque dating to Roman Gaul, probably made from such zinc remnants. The discovery of pure metallic zinc is most often credited to the German Andreas Marggraf, in the year 1746, but the whole story is under dispute. In 1597, Libavius, a metallurgist in England, received some quantity of zinc metal in its pure form, which was unknown to the West until then. Libavius named it "Indian / Malabar lead," and Paracelsus (1616) was credited with giving the name zinc. Ignorance of the value of this metal can be gauged from the fact that until 1751, Postlewayt's Universal Dictionary (the most authentic source of all technological information in Europe) did not mention anything about zinc. In 1738, William Champion is credited with patenting in Great Britain a process to extract zinc from calamine in a smelter, a technology he acquired after visiting the Zawar zinc mines in and around Zawarmala, Rajasthan. His first patent was rejected by the patent court on grounds of plagiarizing the technology common in India. He was, however, granted the patent on his second application. Calamine was the mineral source of zinc metal until the development of the zinc sulfide flotation technique, noted below. Zinc is the twenty-third most abundant element in the Earth's crust. There are zinc mines throughout the world, with the largest producers being Australia, Canada, China, Peru, and the United States. Mines in Europe include Vieille Montagne in Belgium; Hill of Tara, Galmoy, and Lisheen in Ireland; and Zinkgruvan in Sweden. Minerals from which zinc is extracted include sphalerite (zinc sulfide), smithsonite (zinc carbonate), hemimorphite (zinc silicate), and franklinite (a zinc spinel). The most heavily mined ores (particularly sphalerite) tend to contain roughly 10 percent iron as well as 40-50 percent zinc. Zinc metal is produced using extractive metallurgy. Zinc sulfide (sphalerite) minerals are concentrated using the "froth flotation" method and then usually roasted using "pyrometallurgy" to oxidize the zinc sulfide to zinc oxide. The zinc oxide is leached in several stages of increasingly stronger sulfuric acid. Iron is usually rejected as jarosite or goethite, removing other impurities at the same time. The final purification uses zinc dust to remove copper, cadmium, and cobalt. The metal is then extracted from the solution by electrowinning (large-scale electroplating) as cathodic deposits. Zinc cathodes can be directly cast or alloyed with aluminum. Zinc (from German zink) is a metallic element that is placed in period 4 and group 12 (former group 2B) of the periodic table. In period 4, it immediately follows copper, and in group 12, it lies above cadmium and mercury. It is a moderately reactive element that tarnishes in moist air, producing a layer of carbonate. It reacts with acids and alkalis. When not completely pure, it reacts with dilute acids to release hydrogen. The one common oxidation state of zinc is +2. As an element in group 12, zinc has traditionally been classified as a "transition metal." This view, however, has been changed, based on the current definition of transition elements stated by the International Union of Pure and Applied Chemistry (IUPAC). According to that definition, a transition element is "an element whose atom has an incomplete d sub-shell, or which can give rise to cations with an incomplete d sub-shell" . Zinc does not fit this definition because its atoms and ions contain electrons that completely fill the d orbitals. Naturally occurring zinc is composed of five stable isotopes: 64Zn, 66Zn, 67Zn, 68Zn, and 70Zn. Of these, 64Zn is the most abundant (48.6 percent abundance) in nature. In addition, 21 radioisotopes of zinc have been characterized, of which the most abundant is 65Zn, with a half-life of 244.26 days, and 72Zn has a half-life of 46.5 hours. All the other radioactive isotopes have half-lives less than 14 hours, and most of them have half-lives that are less than 1 second. In the ionic form, zinc is essential for sustaining living organisms. It is estimated that three thousand of the hundreds of thousands of proteins in the human body utilize zinc attached to protein-binding molecules called "prosthetic groups." Over a dozen types of cells in the human body secrete zinc ions, and the roles of these secreted zinc signals in health and medicine are now being actively studied. Intriguingly, brain cells in the mammalian forebrain are one type of cell that secretes zinc, along with its other neuronal messenger substances. Other cells that secrete zinc include those in the salivary gland, prostate, immune system, and intestine. Zinc salts are effective against pathogens in direct application. Gastrointestinal (GI) infections are also strongly attenuated by ingestion of zinc, and this effect could be due to direct antimicrobial action of the zinc ions in the GI tract, or absorption of the zinc and re-release from immune cells or both. The direct effect of zinc (as in lozenges) on bacteria and viruses is also well established, and it has been used as palliative salves in zinc salts since at least 2000 B.C.E. However, exactly how to deliver zinc salts against pathogens without injuring one's own tissues is still being investigated. Significant dietary intake of zinc has recently been shown to impede the onset of flu. In addition, clinical studies have found that zinc, combined with antioxidants, may delay progression of age-related macular degeneration, but its effectiveness appears to be limited. Foods and spices that contain the essential mineral zinc. 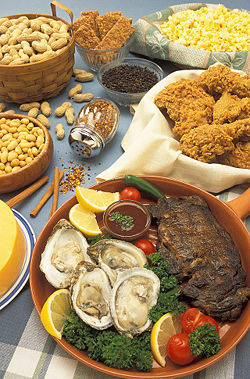 Zinc is found in oysters, and, to a far lesser degree, in most animal proteins, beans, nuts, whole grains, pumpkin seeds, and sunflower seeds. Phytates (salts of phytic acid), which are found in whole grain breads, cereals, legumes and other products, have been known to decrease zinc absorption. Soil conservation techniques analyze the vegetative uptake of naturally occurring zinc in many soil types. Zinc deficiency results from inadequate intake or absorption of zinc into the body. Signs of zinc deficiency includes hair loss, skin lesions, diarrhea, wasting of body tissues, and, eventually, death. Eyesight, taste, smell, and memory are also connected with zinc and a deficiency in zinc can cause malfunctions of these organs and functions. Congenital abnormalities causing Zinc deficiency may lead to a disease called Acrodermatitis enteropathica. Obtaining a sufficient zinc intake during pregnancy and in young children is a real problem, especially among those who cannot afford a good and varied diet. Brain development is stunted by zinc insufficiency in utero and in youth. Teenage boys require 11 milligrams of zinc. Even though zinc is an essential requirement for a healthy body, too much zinc can be harmful. For instance, excessive absorption of zinc can also suppress copper and iron absorption. Swallowing an American one-cent piece (98 percent zinc) can damage the stomach lining due to the high solubility of zinc ions in the acidic stomach (Bothwell and Mair, 2003). The British penny, by contrast, is made from copper-plated steel. There is also a condition called zinc shakes or zinc chills that can be induced by the inhalation of freshly formed zinc oxide during the welding of galvanized materials. Zinc toxicity, mostly in the form of the ingestion of U.S. pennies minted after 1982, is commonly fatal in dogs where it causes severe hemolytic anemia (Stowe, et al. 1978, 270). In addition, the free zinc ion in solution is highly toxic to plants, invertebrates, and even vertebrate fish. The Free Ion Activity Model (FIAM) is well-established in the scientific literature, and it shows that just micromolar amounts of the free ion kills some organisms. Zinc and its alloys have a number of applications, some of which are given below. Zinc is used to protect steel from rust and corrosion by either (a) galvanization, in which the metal is coated with zinc through an electrochemical process; or (b) Parkerizing, in which the metal is dipped in a zinc solution in phosphoric acid. Zinc is used in alloys such as brass, nickeled silver, typewriter metal, various soldering formulas and German silver. Zinc is the primary metal used in making American pennies since 1982. Zinc is used in die casting, notably in the automobile industry. Zinc is used as part of the containers of electrical batteries. Zinc is used in contemporary pipe-organ building as a substitute for the classic lead/tin alloy in pipes sounding the lowest (pedal) tones, because it is tonally almost indistinguishable from lead/tin at those pitches, and has the added advantages of being much more economical and lighter in weight. Even the best organ builders use zinc in this capacity. Zinc is the fourth common material used in metal wall tiles, and is used for its germicidal properties in kitchens . Zinc is included in most single-tablet, over-the-counter daily vitamin and mineral supplements. It is believed to possess antioxidant properties, which protect against premature aging of the skin and muscles of the body. In larger amounts, taken as zinc alone in other proprietaries, it is believed by some to speed up the healing process after an injury. Preparations include zinc acetate and zinc gluconate. Zinc is used as the anode or fuel of the zinc-air battery/fuel cell. The highly characteristic metal counters of traditional French bars are often referred to as zinc bars (or zinc), but zinc has never been used for this purpose, and the counters are really made of an alloy of lead and tin. Roughly one quarter of all zinc output is consumed in the form of zinc compounds. Some of their uses are listed below. Zinc oxide is perhaps the best known and most widely used zinc compound, as it makes a good base for white pigments in paints and watercolors. It is also used as an activator in the rubber industry. As an over-the-counter ointment, it is applied as a thin coating on the exposed skin of the face or nose to prevent dehydration of that area of skin. It can protect against sunburn in the summer and windburn in the winter. Applied thinly to a baby's diaper area (perineum) with each diaper change, it can protect against rash. Zinc chloride is used as a deodorant and can also be used as a wood preservative. Zinc sulfide is used in luminescent pigments, such as on the hands of clocks and other items that glow in the dark. Zinc methyl (Zn(CH3)2) is used in a number of chemical reactions to synthesize organic compounds. Zinc stearate is a lubricative plastic additive. Zinc gluconate glycine and zinc acetate are also used in throat lozenges, to help relieve coughing and symptoms of the common cold . Stowe, C.M., R. Nelson, R. Werdin, et al. 1978. "Zinc phosphide poisoning in dogs." JAVMA 173 (1978). This page was last modified on 2 July 2013, at 16:17.